Researcher/writer for BBC TV series 'QI' and 'Museum of Curiosity'. Ex-police officer, ex-chef, ex-monster maker, extra-curious. After leaving school Stevyn gained places at art and catering colleges, but turned them both down and instead accepted a drunken £50 bet with his homicide detective father that he could survive six months as a police officer. He consequently joined the Metropolitan Police Service in London and ended up staying for 30 years. During his service he found himself frequently challenging the traditional or ‘accepted’ ways of doing things. A knowledge of behavioural economics, critical thinking and his own natural skepticism made him to explore different ways of tackling crime, disorder and community issues, often in innovative and unusual ways. These included using wizards to tackle street gambling, lollipops to stop anti‐social behaviour and dog shows to prevent homicides. Ultimately, he was asked by New Scotland Yard and the Home Office to be part of an experimental unit to explore new ideas, many of which have now found their way into everyday policing across the UK. The Skeptical Bobby is the story of that journey, illustrated with humorous stories, fascinating insights and some really clever problem solving. Some of the content of this talk will be in Stevyn's new book 'Why Did The Policeman Cross The Road' which will be in the shops in May 2016. ‘We need more (ex) cops like Stevyn Colgan but we also need more writers like him! 'Why Did the Policeman Cross the Road?' is a model of smart storytelling, cunning insight, and pure inspiration.’ - Stephen J Dubner, Co-author Freakonomics, Superfreakonomics, Think Like A freak and When To Rob A Bank. Given the bewildering variety of life on Earth – all stemming from one self-replicating molecule – can we really predict what life on other worlds is like? Maybe not. But we can imagine what it isn’t like. Stevyn Colgan has been involved with aliens for three decades. He’s held Jabba the Hutt’s face, helped sculpt creatures for Bruce Willis to shoot at and had a script accepted for 'Doctor Who' in the 1980s. In this entertaining talk you’ll hear about feuding gangs of scientists, the unlikelihood that any visiting aliens will be humanoid, film directors with less imagination than children, fractal nose worms and the perils of concrete poo. You’ll also come to realise that if we really are intelligently designed, the designer needs their head examined. People give all kinds of reasons for why they can’t create art. Sometimes it stems from an event in their childhood when their work was so heavily criticised that they lost all confidence. Sometimes it’s not knowing where to start. But most often it’s the presumption that you’re either born an artist or you’re not. And it’s simply not true. Many talks on art are aimed at improving existing technique. This talk is for the person with no technique; for the person who says ‘I can’t do it’. Using a combination of life coaching, fascinating facts and practical exercises that the listener can join in with, Stevyn Colgan dismantles the most common objections and blocks to creating art and shows you that, if you want to create art, you can. Artistic expression is something deep within all of us. All that’s needed to bring it out is confidence and a little know-how. This talk will show you how. Suitable for all ages 10-100. For many years, we have known about something called Six Degrees of Separation; the idea that every person on this planet can be linked by a chain of just six, or fewer, individuals. But you can do the same thing with facts; a kind of Six Degrees of Information. 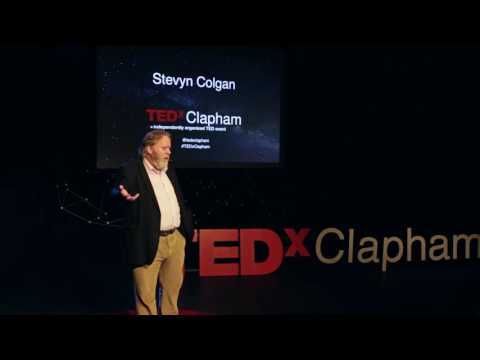 Stevyn Colgan, QI 'elf' and the author of 'Joined-Up Thinking' and 'Constable Colgan's Connectoscope®' is one of those people who can't stop finding connections between things. And in this talk he takes you on a dizzying journey of interconnectedness. Starting with Einstein's fruitbowl he weaves a story that connects Adam's fig leaf to the invention of the catflap, the Kardashian Sisters to kangaroo reproduction, and fennel fronds to training shoes and Greek goddesses. You'll learn what the seven dwarves might have been called, why horses are like bananas, how much the internet weighs and what the centre of our galaxy smells like. And you will discover that everything, absolutely everything, is connected. Currently: Author, QI elf, artist, speaker, tea aficionado. TED, Ageas Kuala Lumpur, Huddle (Google) London, QEDCon Manchester, HybridConf Berlin, 5x15, Federal Bureau of Investigation, O Behave! podcast (Ogilvy Change, London), Edinburgh Fringe, Hay Festival of Literature and the Arts, Latitude Festival, Saturday Live (BBC R4), CreatED, Josie Long's Short Cuts (BBC R4), Skeptics in the Pub (100+ appearances), Harrogate International Festival, BBC 6 Music, Fortean Society, Waterstones Bookshops, BBC Radio Wales, Central St Martins College of Art, UK Home Office, Warwick University, Law Lounge, Little Atoms Podcast, Tilley Awards, Salon London, Village Green Festival, North Carolina Law Enforcement Joint Chiefs, Do the Right Thing, Cornbury Festival, Ethical Society, Strange Quarks Podcast (The Guardian), Funzing, Metropolitan Police Service, Science Showoff, Transmission Awards, Imperial College, Ig Nobel Prizes, Salon North, St Barts and the London Teaching Hospitals, Prudential, GeekFest, InKredulous, National Physical Laboratory, Plain English Campaign, WAWOW, US Department of Homeland Security, Skeptic Zone podcast (Australia), Scottish Parliament, Curious Edinburgh, Buckinghamshire New University, Museums Showoff, Channel 4's 'Bad Dates', National Society for Epilepsy, British Humanist Association, Z List Dead List, BBC Radio 6 (The George Lamb Show), Birdie, Safer London Awards, Royal Masonic School for Girls, Merseyside Police, Brighton Fringe Festival, York University, Royal College of Art, Frontline Club, Dinosnores (Natural History Museum London) and many, many more.